Tokyo Gov. Yuriko Koike waves the Olympic flag and introduces the world to the 2020 Tokyo Games and ‘Super Abe’. Photo credit: Fernando Frazão/Agência Brasil. As the Olympic Games came to a close in Rio on Sunday, Tokyo introduced itself to the rest of the world as the host city for the 2020 Games. 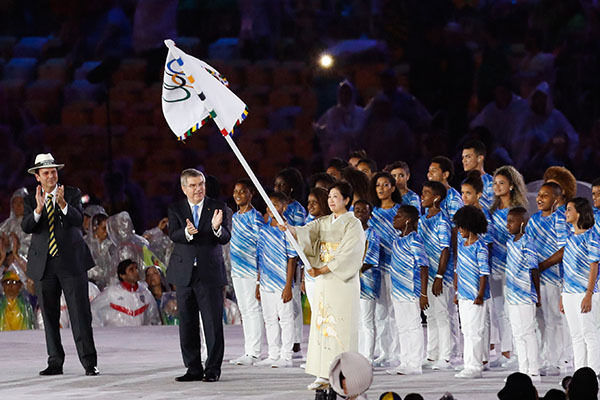 Rio Mayor Eduardo Paes and International Olympic Committee President Thomas Bach handed the Olympic flag to Tokyo Gov. Yuriko Koike. Wearing a traditional, summery-coloured kimono and waving the Olympic flag, Koike kicked off a presentation of the 2020 Tokyo Games on the world stage. Koike is the first elected female governor of Japan’s capital, having just stepped into the role on August 1st. In a performance that saw Japanese Prime Minister, Shinzo Abe pop out of a green pipe with a red Mario hat and red ball as ‘Super Abe,’ Japan reminded the international audience that it has created some of the world’s best-loved video game characters. ‘Super Abe’ tossed the ball to retired Olympic swimmer, Kosuke Kitajima, who won gold medals in both the men’s 100 and 200-metre breaststroke at the 2004 Athens and 2008 Beijing Olympics. Aomori University’s gymnastics team performed a routine alongside a computer generated display, emphasizing Japan’s technological prowess, as well as it’s gymnastics team’s success. The team won three medals this games, third in medal standings in gymnastics. The day before the closing ceremonies, Japan laid out its economic plans for the 2020 Games, promising to spend taxpayers’ money responsibly, and not create ‘white elephant’ venues in a news conference in Rio. “I will not leave white elephants to the taxpayers. I will leave a good legacy. That is the direction I want to see the games take,” said Koike at the conference. The stadium from the 1976 Montreal Games, Régie des installations Olympiques (ironically abbreviated as RIO) cost an equivalent to today’s market of $4 billion and took the taxpayers 30 years to pay off. The stadium is used for occasional sports games and concerts, but cannot be used in the winter because of around 6,000 tears in the fibreglass roof, which cannot support the weight of snow, making it unsafe for visitors. It estimated that RIO needs about $300 million to be repaired. Brazil faced immense criticism in how money was spent for the 2014 FIFA World Cup, and significantly cut down its budget for the Olympics. According to the Rio 2016 website, the overall cost of the Games was $7.1 billion. In comparison, the 2012 London Games cost approximately $15 billion. “What they did in Rio was a good reference for us. For the purpose of budget reduction in Rio, various innovative ideas were introduced. For us too, of course, we have to reduce costs and not waste money,” said Toshiro Muto, Tokyo 2020 CEO at a news conference. Tokyo is already facing controversy, when it was released that the National Stadium for the 2020 Tokyo Games had a projected coset of ¥252 billion, approximately $2 billion USD. Backlash from the costs forced organizers to review their plans for the stadium.